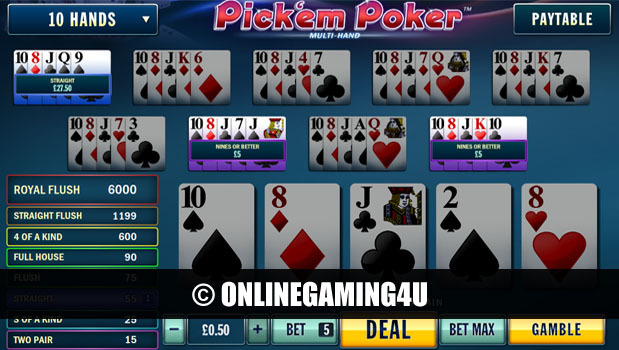 Pick’em Poker is an amazing variation of online video poker played with up to 100 hands per game. This brilliant twist on the ever popular video poker series brings together low stakes, high payouts and more odds-on chances of winning. Players can choose to play Pick’em Poker with any number of hands that they choose. The minimum is 1 hand per game and the maximum is 100 hands! This more-payout version of the game offers prizes on the paytable for achieving 9’s or better, meaning more winning combinations and more cash paid out per round of betting on average. Each player is in full control of their betting per round by choosing their stake (from as little as 1p – 10 hands minimum), right up to £5 stake per game. What’s more is that players can choose the number between 1 – 5 to bet per hand. In addition to these game variables; you can also choose to bet max and repeat bet with the same conditions. If a winning combination of cards is activated, players can also choose to double their payout. You can do this by hitting the gamble button. The exclusive gamble button mini-game shoots over to a high card gamble screen (in-game) that players can pick a card that is higher than that of the dealer’s choice. During this mini-game players select whether they would like to collect their money (quit round and cash out), double half of the winnings or double all of their winnings from the game-round. Pick’em Poker features a dynamic paytable that differs depending on how many hands are in play. Winnings are then determined by the figure you select. 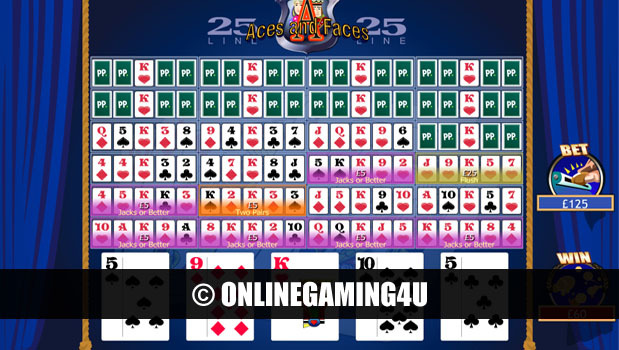 The difference between this game and other video poker variations is that at the start of the game players are dealt 2 cards and 2 stacks of 3 cards. The top-most playing card of each stack is face up. Players then choose which stack of cards you wish to keep and the other stack is discarded. The top card of your chosen card stack is used across all hands.